Did you know that roosters in other parts of the world speak a different language than roosters in America? I got a wide range of different answers. “Kukeleku, of course” said Sietse my Dutch friend. “Cocorico,” said Diane my French friend. “Kickeriki,” said my Italian friend Hans who comes from the part of Italy where they speak German. “Quiquiriquí­,” said Iñake, my friend from the Basque region of Spain. All of these words, of course, refer to the same exact rooster crow that we all know. Every language in the world creates different onomatopoeia for the same sound, thus all the different words. I had my friends write down how they spelled the rooster noise in my little notebook, and I laughed at all the different spellings. But the thing that is most interesting to me is that the way that the word is written and pronounced changes the speaker’s perceptions of the original sound. We’re now about halfway through the second half of the Annapurna Circuit (the “Jomsom Trek”), and this gigantic bovine showed up out of nowhere! My friend Brian (from Ireland) took this photo, and Hans is the one in the middle. The Dabur Foods Company owns rural Nepal. 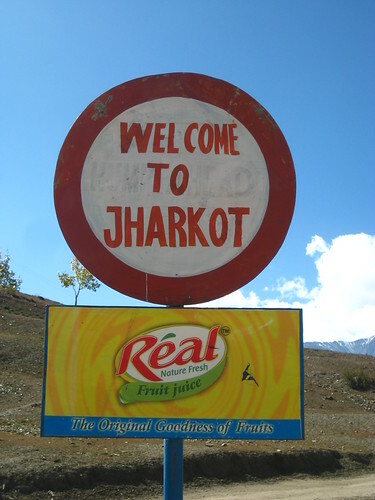 For whatever reason, Real Fruit Juice’s parent company, Dabur Foods, decided that they should focus its advertising dollars on the inhabitants (and trekkers) who go through these little mountain villages. In exchange for advertising, Real has provided FREE signs to business owners and the local government. 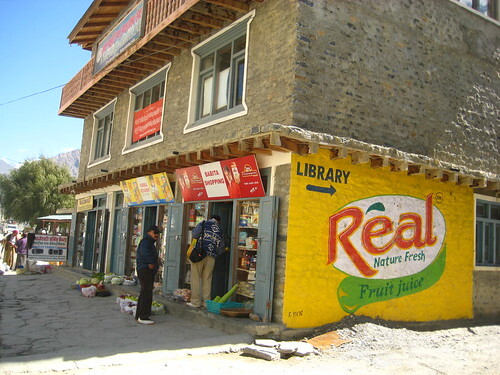 Half the sign is a Real juice ad, the other half says “Welcome to Jomsom” or “Hotel Yak & Yeti.” They’ve also paid people (presumably very good money) to paint entire walls of their houses yellow, and slap the Real logo on it. These goats don’t know it, but they’re headed for the dinner table. Animal sacrifice deep-rooted in Nepal’s culture. “Nepalese kill animals to sanctify weddings, new homes or religious festivals. Upon purchasing a new car or truck, the owner sometimes splashes its exterior with fresh animal blood, to ensure the vehicle doesn’t crash whenever it is driven. When an animal is to be sacrificed, it should be an uncastrated male which is killed, apparently as a display of life’s potency. This death to please the gods is also interpreted as doing the animal a favor by releasing it from a life of suffering, amid hopes that it may be reborn as a much more fortunate human. Every few minutes as we walked around the circuit, we’d hear a gunshot as the next goat was put to death. We also saw the actual butchering of several goats — which you’ll see below. WARNING: Some of the photos in this set are graphic. This is a short video I recorded from the window of our jeep while we drove from the China border to Kathmandu. Nepal is a really great country to observe through the window of a vehicle. All the houses are built right up next to the roads (because the canyons are so steep that there is no level land elsewhere), and everyone keeps their front doors and windows open during the day. 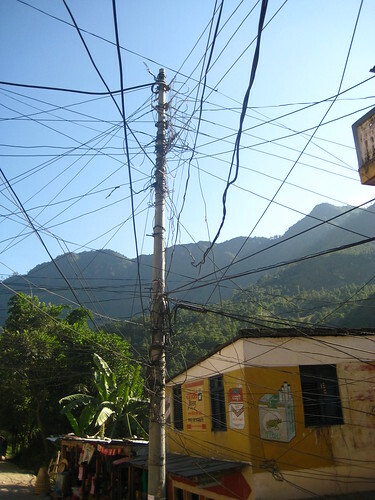 People live in their front yards in Nepal. 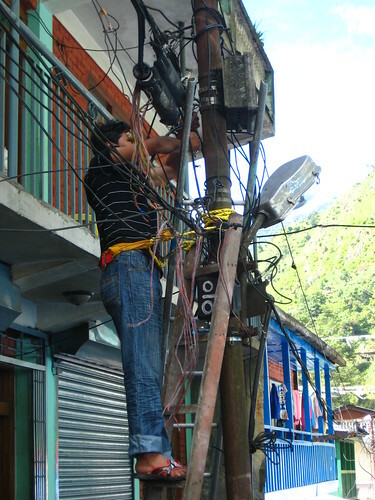 The Nepalese carry everything on their foreheads. They loop a strap around their load, toss it on their back and tie the whole thing onto their head. Giant loads of hay. Building supplies. Crates of live chickens. All of it is carried on the forehead. The HORNS! Trucks and buses here are outfitted with racks of up to a dozen horns, and a single button sets off an extended, merry melody of honks. The novelty of the soon wears off, though. Drivers in Nepal insist on honking their horn at every possible opportunity: every time they pass someone, every time they approach a blind corner, every time someone is going slow (even if there is a clearly visible obstacle impeding them). And sometimes just for the heck of it. The villages have one or two communal water sources, delivering a constant stream of mountain water through a spigot into an open concrete structure. This is the sole drinking water source, where women do laundry and everyone bathes. Every house has a big open front, and doubles as a little general store. There’s usually food, cigarettes, and a small assortment of clothing, shoes and cheap goods (mostly made in China). There are no kitchen utensils. Nepalese people eat everything with their hands. We stopped at a little restaurant on our way through and ordered Dal Bhat — essentially rice and lentil soup — the staple of the traditional Nepalese diet. In some parts of Nepal, this meal is eaten twice a day, every day. Hindu dots on the forehead for good luck. Men wear traditional caps with patterns representing the region that they come from — especially older gentlemen. The women are waaaaaay more attractive in Nepal than in China. This was actually the first thing I noticed. Can you blame me? 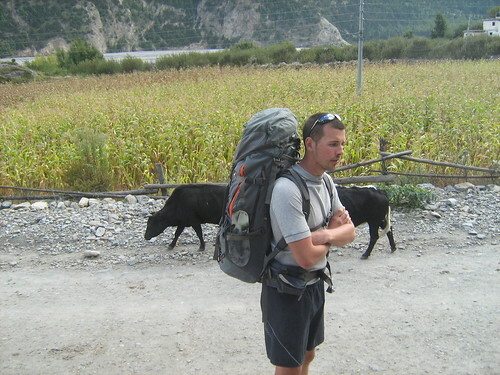 Crossing the Nepali border from Tibet was a really interesting experience. The Friendship “Highway” is a windy, usually one-lane gravel road on the edge of a sheer cliff, precariously inching its way down a narrow river valley on the edge of the Himalayas. 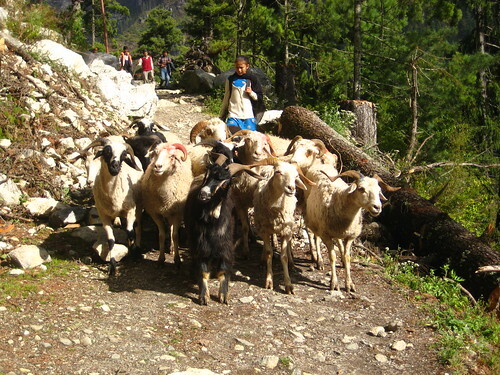 The road is full of sheep and yaks, is often flooded or crossed by waterfalls, and descends over 2000 meters over the course of 30km. It’s steep. It’s dangerous. And it’s the best way into Nepal. As we drive along the bumpy gravel track of the Friendship “Highway” between Tibet and Nepal, we are constantly confronted with roadblocks. The most common? Gigantic herds of goats! Apparently, the goats that people eat in Nepal are raised in the grassy plains of Tibet, and then marched along the highway down the steep, precarious road to the border. Since Tibet essentially has just only road, that’s what the goat herders, the cars, the trucks, and the pedestrians use — and it’s a constant traffic jam. Especially during this part of the fall when it’s goat herding season! 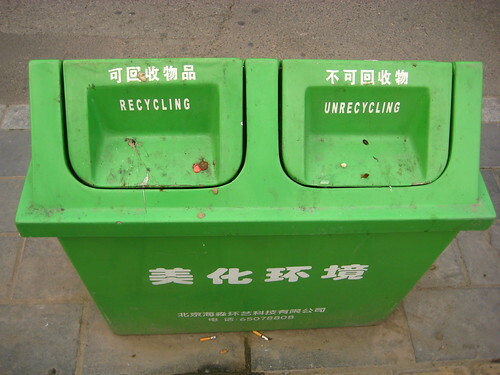 I’ve just spent two months in China, and despite Beijing’s best efforts to improve translations nation-wide, I’m happy to report that Chinglish is still everywhere. There’s nothing better than awesomely hilarious mistranslations!